Susan Mohammed is passionate about health care. She joined the Global Medical Response team at its inception in 2005, having worked previously in public health. Early last year, Susan – who’d been working as an Emergency Medical Dispatcher – began her Paramedic training. She never missed a shift in the Communications Center while pursuing her professional development aims. Now a Field Paramedic, Susan relishes the opportunity to be involved in direct patient care. Susan frequently mentors her peers and makes friends with everyone she meets. Her peers admire her strong work ethic, respect her expert opinion, and appreciate the shining example she sets. 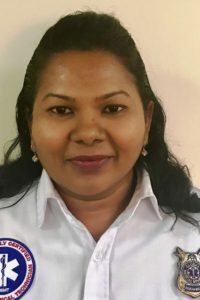 In addition to her multiple EMS certifications, Susan holds a National Nursing Certificate and works part-time as a registered nurse.